This is one of my favorite issues of the year when we have the chance to put a spotlight and celebrate extraordinary women across Chicago during Women’s History Month. Each year, we scour communities to introduce you to women who dedicate their lives to transforming communities around them whether through social work or writing workshops. This year, we bring you Diana Pando, a literary renaissance woman, and Evelyn Diaz, a social wonder who has helped developed programs for disadvantaged women and youth. We hope these women inspire you to make a difference in your community and give back. Working tirelessly to unify writers and artists in Chicago, Diana Pando, dedicates her talents to rewriting the mainstream narrative of the modern Latina experience. 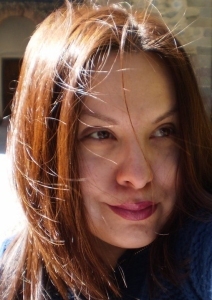 A deeply versatile writer, Pando graduated from Columbia College Chicago in Communications and has published poetry in Rites of Passage, Ariel XXVIII, and has had her short play Thirst performed at Teatro Luna’s 10 x 10 Play Festival in 2010. Pando would later co-found Proyecto Latina, a collective that champions Latina artists and writers and elevates their exposure to the community’s consciousness through readings, workshops and an online forum. In August 2013, Proyecto Latina published Rebeldes, a compilation of 55 writers and artists’ work in both Spanish and Spanglish. She’s a literary renaissance woman in the highest sense, managing to balance her artistic passions with her work as The Resurrection Project’s Media Relations and Community Outreach Coordinator, where she conducts media workshops for non-profit organizations. Yet her current accomplishments would not be possible without her formative years growing up in a working class family in the city. Coming from Mexico, Pando and her family resided in pre-dominantly white neighborhood of Bridgeport on the South Side of Chicago, where cultural and social barriers created daily challenges. But it was those barriers, a lack of a strong Latino presence in her community and an epiphanic meeting with the nationally-recognized fiction writer Ann Rice that inspired Pando to help carve new, creative spaces for people like her to express themselves. “I continued to see that our stories were missing in our communities and our larger public narrative,” Pando said. “The stories that were there were distorted,” Pando said. Now that is about to change. On Monday, March 3rd, Proyecto Latina in collaboration with the online Latino cultural magazine Gozamos, launched the Chicago Latino Writers Initiative at Calles Y Sueños, 1900 South Carpenter in Pilsen. Along with Luz Chavez and Stephanie Manriquez of Gozamos, the women recognized a deep void in writing communities focusing on Latinos, and thus CLWI was born. By cultivating the talented voices of emerging Latino authors, CLWI provides a safe and welcoming atmosphere. CLWI also acts as a vital networking and informative resource through its writing workshops and the creation of the Latino Writers directory, a first of its kind in Chicago. Pando herself lead one of CLWI’s most recent writing workshops entitled Puro Cento, where writers of all genres came together and participated in exercises and discourse. For Pando, these literary passion projects tap into a spirit that’s been reluctantly tapped by mainstream taste-makers. Here, Pando and others, take ownership of the Latino story and infuse it with an authenticity, a love and a sensitivity of those who’ve undergone the experience possess. “Right now is a great time to be a writer who happens to be Latina. There’s a hunger for our stories to be told,” Pando said. Pando reflects on the rigors of that writing process, one that is solitary and frustrating but equates the isolation of that act to faithful gesture. Next up for Pando is the Latino Giving Circle, a part of The Chicago Community Trust. It’s a philanthropic and educational channel for which the organization advises donors with their contributions to community causes. Who knows, those funds could help out a future writer one day. For up and coming Latina writers out there, Pando gives food for thought. “It’s a choice either you do it or you don’t. Take responsibility it’s up to that individual to seek those resources, take the lead to improve the quality of your life for yourself. Action equals reality”.